When it comes to catastrophic, large-scale sickness and plague, the Black Death caused one of the darkest times in world history. The first major outbreak of bubonic plague kicked off in the mid-1300s and reached Europe in 1347. Historians even know how it entered: when ships carrying the dead and dying made port in Italy. Those gathered to meet the ships were met with a terrifying sight. Most of the crews were dead, and the living were covered in oozing boils. Many ships were sent back to the sea, History says, but the damage had already been done. Europeans found out very, very quickly that the plague was highly contagious and extraordinarily deadly. The first outbreak came to an end around 1350, but a few hundred years later, it struck again. This time — again — plague started in Asia and spread to Europe. Historic UK says London was first hit in 1665. The Black Death spread again, and again, it killed thousands. Surely, seeing those boils develop, knowing your days were numbered … surely, that was the worst part of it, right? Not at all. It's easy to assume that dying from the plague was the worst part of it, but history is never easy or straightforward. First, Real Clear Science shares exactly how plague kills. The bacteria mimics another molecule common in the body, one that a person's immune system isn't going to attack. It's only when it gets to the lymph nodes that the rest of the body finally realizes something is horribly wrong. The body goes into overdrive, triggers septic shock, and ultimately leads to organ failure. That's pretty awful, but let's look at the timeline. Historian Mike Ibeji says the Black Death was likely both strains of plague: bubonic and pneumonic. The pneumonic version is airborne, has a kill rate of almost 100 percent, and those who inhale it are usually dead within 24 hours. Alternately, the bubonic plague — the one spread by fleas — followed a different pattern. Once a person was infected, it took between three and five days before they showed any signs of illness. Then, it was only another three to five days before they were dead (via History Today). That's a horrible way to go, but the short time between health and death is why this wasn't the worst part of the Black Death. Ask anyone who's watched a loved one linger in pain for months or even years, and they'll tell you — a quick death isn't so bad. There's worse. The spread of the plague wasn't an accident and it wasn't an act of God. We humans did it to ourselves, and it started with an act of biological warfare. According to the CDC, the primary source for information on the spread of the plague to Europe is the writing of an Italian notary named Gabriele de'Mussi. Europeans, he wrote, were well aware of the fact that in the 1340s, the kingdoms of the Tartars and the Saracens were nearly wiped out by a virulent disease. Christian merchants who were there at the time fled ahead of the outbreak, ending up in a city called Caffa. People being people, it wasn't long before the Tartars laid siege to the city for three years. Toward what would be the end, the army started dying of the same plague. Commanders ordered the corpses of their fallen loaded onto catapults and hurled into the city. De'Mussi wrote, "What seemed like mountains of dead were thrown into the city, and the Christians could not hide or flee or escape from them." Finally, some did escape Caffa to head back to Europe, but by the time they left the city of diseased dead, they were already infected. When they returned home, they brought the plague with them. The CDC notes the irony. The Tartars succeeded in inflicting unthinkable losses on their Christian neighbors, but it didn't even help them. The Christians held Caffa, and the Tartars retreated. It would be nice to think that people might come together in a time of tragedy, but instead, the labor shortages immediately following the plague brought out the worst in some people. 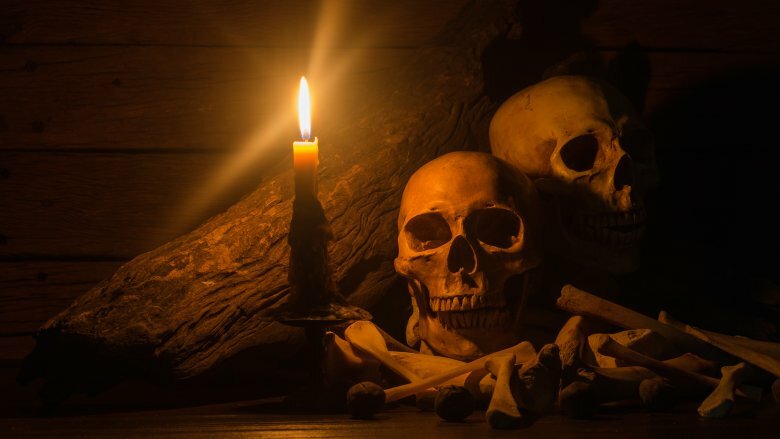 According to Ole J. Benedictow of the University of Oslo, the 14th-century edition of the Black Death killed around 50 million people, or about 60 percent of Europe's entire population. That meant there was a huge shortage of laborers and skilled workers. Supply and demand might suggest that's not entirely a bad thing for survivors, as their work was more highly desired. But it only gave the upper class another opportunity to step on them. 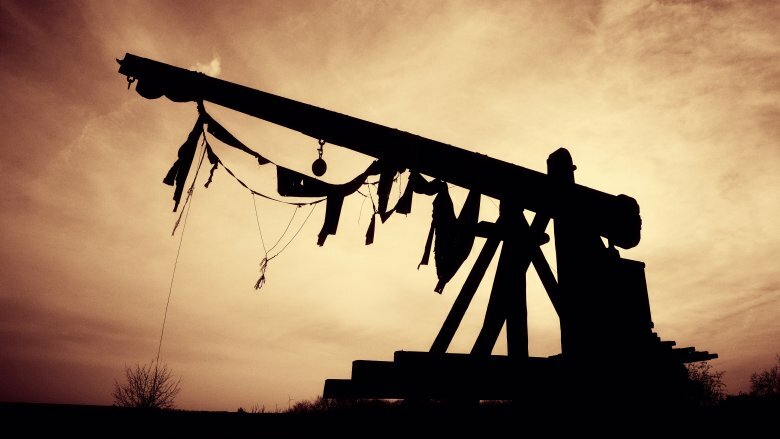 In 1349, English rulers issued an Ordinance of Labourers, making it illegal for workers to demand higher wages. According to the BBC, the ordinance became law in 1351, and it was quickly followed by other laws designed to help keep the lower classes in their place. That included Sumptuary Laws, like those restricting the types of clothes and colors people could wear based on their class. That one was passed in 1363, and that's why Chaucer makes such a big deal of the clothes his pilgrims wear: They're almost all breaking the law. The laws enacted post-plague were so restrictive (even dictating what people could eat) that it led to the Great Revolt of 1381 and the beheading of Archbishop Sudbury. Before the plague swept through Europe, religion was at the center of life. 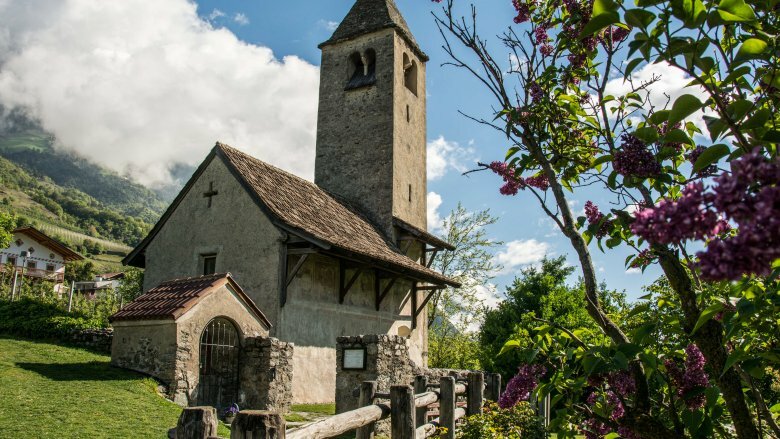 Most people were buried on church grounds, and according to Vice, churches weren't just for praying. They were the beating heart of the community, where people held everything from picnics and plays to dances, parties, and games. Weird, sure, but the important part is to recognize just how important faith was. Death was inevitable, and for many, it wasn't entirely something to be feared. 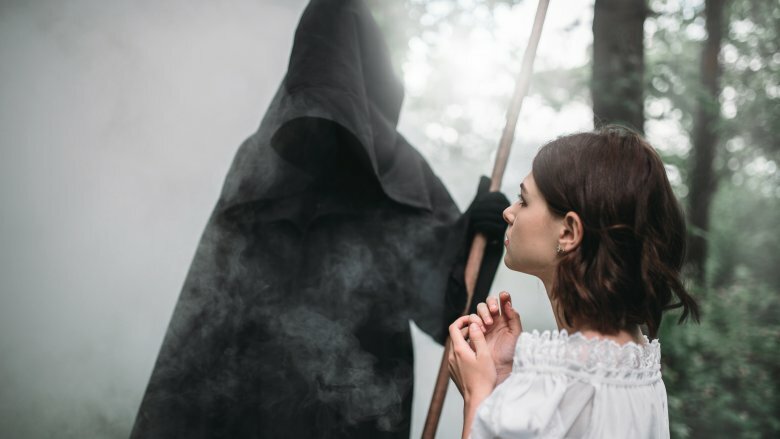 Scores of faithful Christians believed death was simply a gateway, something to be passed through on the way to their final reward for living a good, decent, pious life. Faith allowed people to take comfort in their eventual, mortal end, but suddenly plague was spreading and it seemed as if God had abandoned them all. And that had to be terrifying, especially when the average person saw the clergy losing control. According to Professor Tom James of the University of Winchester, the clergy suffered losses on the same scale as the masses. Death was suddenly no longer a way to pass into a Heaven that was believed to be much, much better than life on Earth, and it was definitely not something benevolent and divine coming to reward the devout. It was ugly, irrational, indiscriminate, and it was everywhere. For a people who only had God as a light in their lives, God was suddenly gone. When the Black Death came again in the 17th century, grisly tasks were given to individuals in hopes of stopping the spread of disease. First, there were the searchers. These were typically older women who were employed by city parishes to visit families, examine the dead and the dying, and report back as to who had been infected. The family would then be sealed inside their home, and a red cross was painted on the door to warn neighbors. Each home was assigned a watcher, who would make sure no one left, no one entered, and no goods were passed from inside to the outside. The final duty was the domain of the corpse-bearer. They worked only at night, collecting bodies from houses (or from where they had fallen on the streets), usually by hooking them with a long pole and slinging them onto the cart. If it sounds like only a horrible sort of person would do this, Art in Society says that's exactly what they were. They were largely uneducated, often drunk, and with a reputation for searching the pockets of the dead before dumping them off in a burial ground. One corpse-bearer of Covent Garden took perverse pleasure in appearing to hawk firewood, then revealing the plague-ridden bodies in his cart. Disposing of the dead brought out the worst in people, and the people who did it en masse? They embraced it. 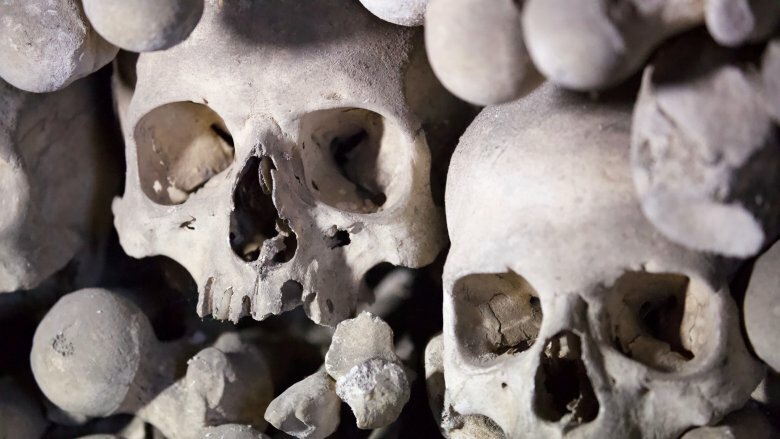 Everyone's heard of plague pits, mass graves where the bodies of plague victims ultimately ended up. There were so many bodies, goes the popular belief, that they were unceremoniously tossed in as soon as they dropped. But that's not actually true, and the truth is even more heartbreaking. 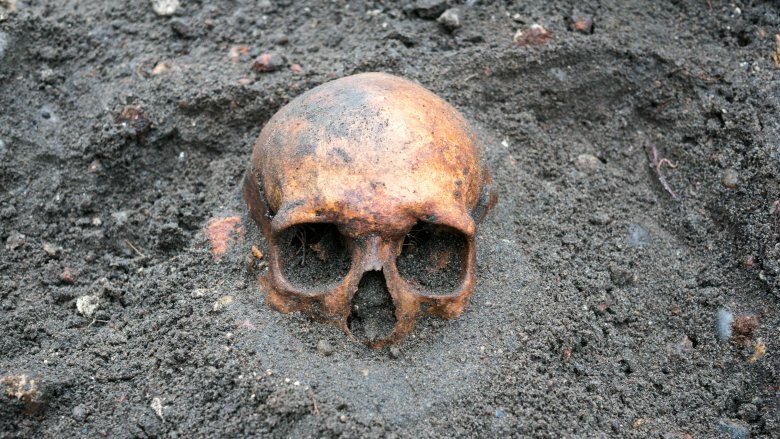 In 2016, a plague pit was uncovered in Lincolnshire, on the grounds of a long-ruined medieval abbey. The gravesite was dated to 1349 and contained 48 bodies. Twenty-seven were children. They had all been laid out carefully, positioned side-by-side in even rows. According to the Smithsonian, archaeologists have interpreted that to indicate even though the world was falling down around them and God had apparently abandoned them, mourners still took the time to be as respectful as they could and bury their loved ones with care. Archaeologists found many had been buried with small trinkets, and one even had an amulet fashioned into a protective symbol. While it's impossible to tell exactly what happened in the community, they suspect either the priest or the gravediggers had succumbed to the plague, and the community had dealt with their dead as best they could. And, they did, even those undoubtedly showing the first signs of illness themselves. Any time tragedy strikes, it's human nature to try to find an explanation — any explanation. When there isn't one, that's where things can go from bad to worse in a flash. In the 14th century, people across Europe were looking for an explanation as to why there was so much disease and death. The idea that there was no reason was terrifying, so people made up their own. By fall of 1348, rumor had spread far and wide that the plague was actually a Jewish conspiracy, unleashed upon Christendom with hopes of destroying an entire faith. 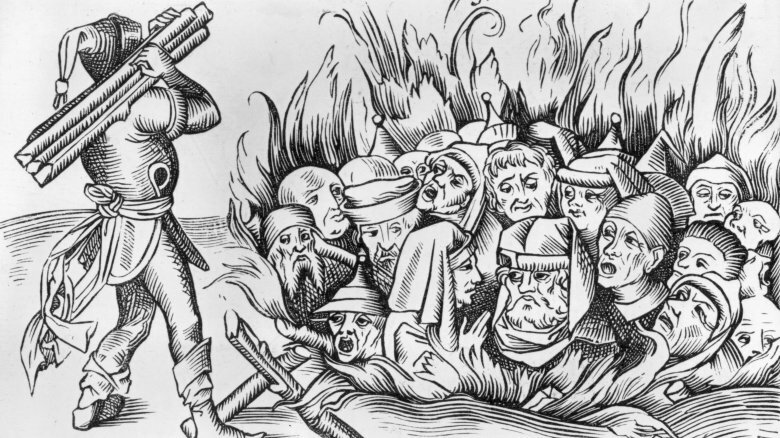 The rumors settled around Savoy and Lake Geneva, where a group of Jews supposedly acting at the behest of a Rabbi Peyret had kicked off a plot to poison Christians in Italy, France, and Switzerland. According to Fordham University, it was these Jews who were arrested and tortured, and who eventually confessed to the plot. The news was sent along the Rhine River, and it kicked off a massive campaign of retribution. Hundreds of town and hamlets were burned to the ground, and thousands of Jews were executed by the angry masses. The slaughter was so widespread and so brutal that it would be another three centuries before those of the Jewish faith had rebuilt enough that their culture could once again have an impact on and make contributions to the countries where they lived. Imagine, for a moment. It's the 17th century, a small village of only a few hundred people. Friends, neighbors, family. A man from London comes with a delivery of fabric, and before he can leave, he falls ill with the same symptoms as the plague that decimated entire populations just long enough ago it's no longer recent memory. He dies, and within weeks, 42 villagers succumb to the same illness. Now, imagine the town's new rector has decreed that to keep the sickness contained and the surrounding villages safe, no one was to leave town. That even applied to those that still seemed healthy, and believed they might have a chance … if only they were to flee. That's exactly what happened in the village of Eyam. According to the BBC, the self-imposed quarantine ran through the summer months and by August 1666, deaths peaked at six per day. It was unthinkable. Elizabeth Hancock buried her husband and six children, losing them all in just eight days. 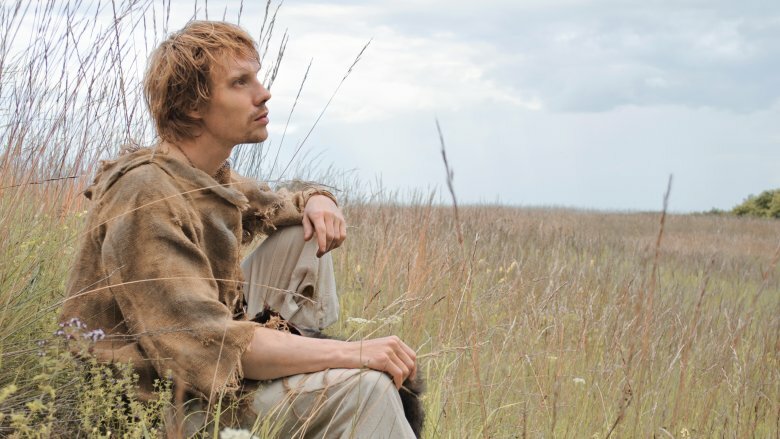 Marshall Howe survived only to bury his entire family, then went on to bury his neighbors (and take their possessions). William Mompesson, the rector who had imposed the quarantine, buried his 27-year-old wife the morning after they enjoyed a few moments of peace walking through the nearby hills. 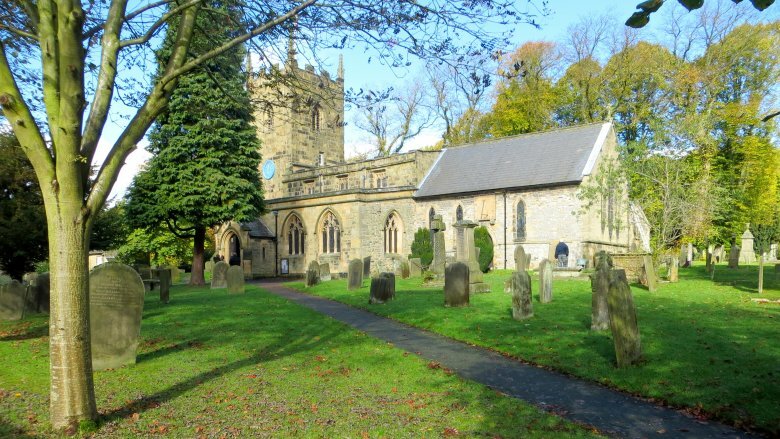 Eyam's mortality rate was much higher than even London's, but their actions saved thousands from neighboring villages, some who watched from the hilltops as they buried their dead. Large-scale death can be almost incomprehensible, and that's why stories of individuals are so important — they give the world a tiny glimpse of what it must have been like. One chronicler from Florence wrote of carrying the dead to the church, where pits had been dug deep. The poor were stacked on top of each other through the night then covered with dirt in the morning. He described it as "just as one makes lasagne with layers of pasta and cheese." Oof. The great humanist Petrarch recorded the story of his brother. It was tragic, he wrote, not because his brother died, but because he lived. Before the plague, the monastery at Monrieux was home to 35 monks. One by one, they died, leaving only Petrarch's brother and his dog alive to bury the brothers and tend the fires of the monastery, alone. When it comes to Ireland, one of the few complete records left is from Brother John Clyn of the Friars Minor in Kilkenny. 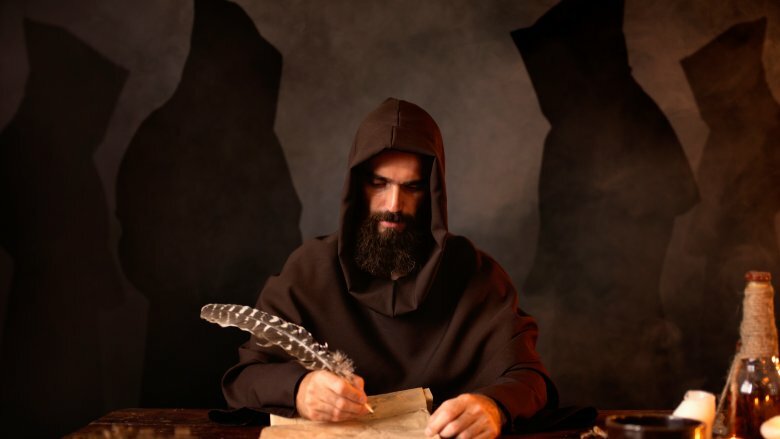 He recorded the horrors he saw, finally writing, "I, … waiting among the dead for death to come, have committed to writing what I have truly heard and examined; … I leave the parchment for continuing the work, in case anyone should be alive in the future." His chronicle ends there, save a single line in different handwriting: "Here, it seems, the author died." The Black Death had a whole slew of immediate consequences, but the ripples were felt even centuries later in the USA. Oppression certainly didn't end with the Civil War, and according to the Constitutional Rights Foundation, one of the many types of laws put in place in lieu of slavery were the vagrancy laws of the Southern Black Codes. Essentially, these laws allowed authorities to arrest any vagrants they came across. Punishments varied by skin color, but if they were black, they were sentenced to hard labor, or hired out to local employers to "work off their punishment." That was standard throughout the 1800s, and the laws lasted a long time. Vagrancy laws in Florida, for instance, were only overturned in 1972 (via the New York Times). And those laws had their roots in the plague years. William Chambliss of the University of Washington wrote that the first vagrancy laws were passed in England in 1349 (although the general concept dated back further). It was only during the plague that laws were designed to force people to work where they currently lived. For example, it was illegal for peasants to beg instead of work or to refuse to serve the master of the land they were currently living on. From keeping peasants from looking for better opportunities to doing the same thing with newly freed slaves centuries later, laws enacted during the plague caused oppression for generations.